Schoenbrunn Continental Restaurant at Lotte Hotel Seoul will present a "5 Chateaux" Gala Dinner featuring five of the most exclusive French wines at 7 p.m. on Nov. 24, 2005. The gala event will celebrate Schoenbrunn renaissance with its new concept "'Back to the Classics." 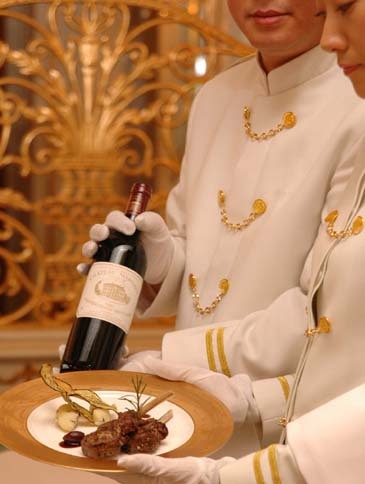 The gala seven-course dinner will be perfectly matched to five Chateau wines of 1999 and include Chateau Palmer, Chateau Brane Cantenac, Chateau Margaux, Chateau Mouton Rothschild, and Chateau Climens, all world-acclaimed and recognized as the best wines. In charge of the cuisines is Michelin Star chef, Sylvain Dubreau who has been newly appointed to present the new Schoenbrunn. Mr. Dubreau's experience includes Les Ambassadeurs restaurant at the world-renowned Hotel de Crillion, and "La Tour d'Argent," another notable Michelin Star restaurant. To round out the evening, a live performance of baroque music will provide an elegant ambiance. Participation fee is 250,000 won per person, and Service Charge & VAT are excluded. Chef Dubreau will present different themed menus every day from November 21st through the 25th to maximize variety and patron's dining pleasure. For inquiries call Schoenbruun at (02) 317-7181.